The widespread legalization of adult use cannabis is giving consumers a new vice to consider – and that could dent sales of some alcoholic beverages. That’s one of the theses of investment bank Cowen, a firm that has been at the forefront of coverage of the cannabis space. Both recreational cannabis and alcohol serve similar functions as social lubricants, which could lead to some substitution. Azer in a report published Friday cited Nielsen data, which showed combined beer sales were flat for the four weeks ending on December 29, coming in just slightly above the 0.3% decline seen over the past 12 weeks. And the National Beer Wholesalers Association’s Purchasers’ Index registered at 47 for December, coming in below the reading of 55 from December 2017 and extending a four-month trend of readings below 50, indicating contraction in total beer orders placed with suppliers. Based on a Cowen survey, beer was the most popular alcoholic beverage among current and former cannabis users, and 60% of current consumers cited a reduction in alcohol consumption when mixing the two products. And 70% of lapsed cannabis users – or those who had used cannabis in their lifetimes but were not current users – said they believed they would reduce their alcohol consumption if they returned to use, “suggesting there could be an even greater impact to alcohol consumption if and when lapsed users re-enter the category,” Azer said. While only about 20% of consumers reported perfect substitution between cannabis and traditional alcoholic beverages, “What you’re really worried about is this marginal alcohol unit,” Azer said. Some other firms aren’t convinced cannabis is the culprit for lukewarm beer sales. A study released last week from the Distilled Spirits Council examining trends in Colorado, Oregon and Washington – three U.S. states which have had adult use legalized the longest – found that while per capita consumption of beer sales has steadily dropped in the past several years, the sizes of the declines have been roughly consistent with the national average. The study found that per capita beer sales declined 3.6% in both Colorado and Oregon and 2.3% in Washington, based on state-level alcohol tax receipts and shipment data for the two years prior to recreational marijuana legalization and up to four years post-legalization. This compares to an about 4% decline at the national level. But when considering per capita total beverage sales including spirits, wine and beer, the results were roughly flat, with increases in per capita wine sales in Colorado and Oregon offsetting some of the decline in beer sales. This may undercut the idea that adult use cannabis is behind the decrease in beer sales, when a consumer taste shift toward other alcoholic beverages may in fact be to blame, said David Ozgo, senior vice president of economic and strategic analysis for the Distilled Spirits Council. A spokesperson for the Beer Institute, a national trade association representing members of the beer industry, echoed these sentiments in a statement to Yahoo Finance. “We haven't seen conclusive evidence that marijuana has impacted beer sales thus far in the states allowing adult recreational use," the spokesperson said. 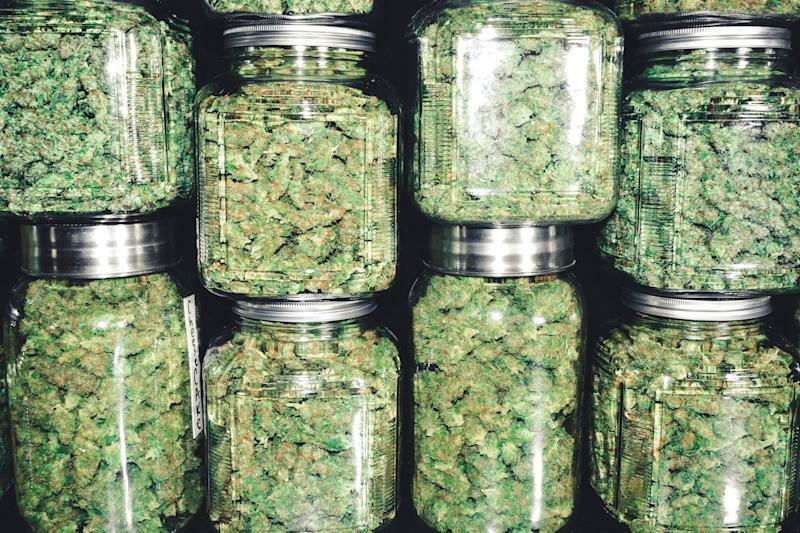 Brewers have nonetheless begun to take note of cannabis’s rapid expansion, which has accelerated in recent months as legalization becomes more widespread. Currently, 10 states and the District of Columbia have passed laws allowing for recreational use. Canada in October became the first Group of Seven nation to legalize adult use cannabis at the national level. Azer said she estimates the U.S. cannabis industry currently generates sales of about $50 billion. While still a far cry from the estimated $234 billion total beverage alcohol market in the U.S. today, the cannabis industry is expected to grow sales to $80 billion by 2030, assuming nationwide adult use legalization. This would imply a compounded annual growth rate of about 4% for the cannabis industry, while total beverage alcohol consumption has grown at a 2.3% CAGR for the past decade, Azer noted. AB InBev (ABI.BR), the world’s largest brewer, partnered with Tilray in a $100 million joint venture to research cannabis-infused non-alcoholic drinks for the Canadian market, the companies announced in December. The Canadian unit of Molson Coors Brewing Company (TAP) teamed up with cannabis producer Hydropothecary Corporation (74H.F) for a similar venture in August. Constellation’s investment – the largest disclosed investment in the cannabis space at the time of its announcement in August – has led to scrutiny from some analysts, especially as Constellation has already written down the value of its Canopy stake by $164 million in the third quarter. Burleson said it’s “right in the wheelhouse” of traditional beverage giants to wade into the cannabis space, given their legacy strength in distribution and marketing for consumables. Beverage companies, for their part, seem to agree.